Contribute to boost your natural defenses. Contributes to improve your inmune system. SAFE: Probiotic strains of proven safety. EFFECTIVE: Given the combination of probiotic and vitamin C assets. COMODA: Easy to take, transport and administer. Nice presentation for children. • Contributes to boost the body own defences. 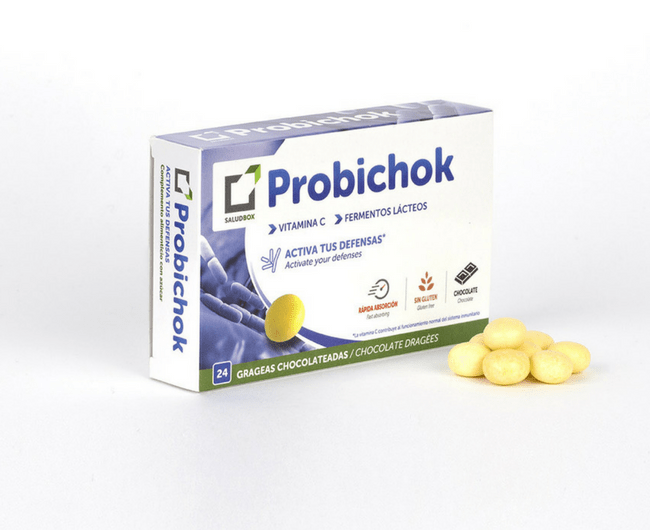 • Provides probiotics strains of demonstrated efficacy in different pathologies, reducing the absorption of pathogens. It is recommended to take 2 choclate sweets per day. It is advisable not to take more than recommended dose. It can be taken at any time, regardless of meals. • Probiotic mixture1: A selection of strains of demonstrated efficacy in different pathologies. Synergy improves the immune response, protecting the body against external aggressions. • Vitamine C2: Helps boosting the immune system. Keep away from children under 3 years old. Contain lactose, soy and milk protein.